Carrie Fisher has confirmed she will return for 'Star Wars: Episode VII'. The 56-year-old actress - who starred in the original 'Star Wars' trilogy between 1977 and 1983 along with Harrison Ford and Mark Hamill - will reprise her role of Princess Leia in the forthcoming J.J. Abrams-directed film in 2015. When asked if she will play the character in the movie, she told Palm Beach Illustrated: "Yes." Carrie is expecting her alter-ego - who is one of the main protagonists in the original movie trilogy and the twin sister of main character Luke Skywalker (Hamill) - to be "just like she was before", except older and slower. 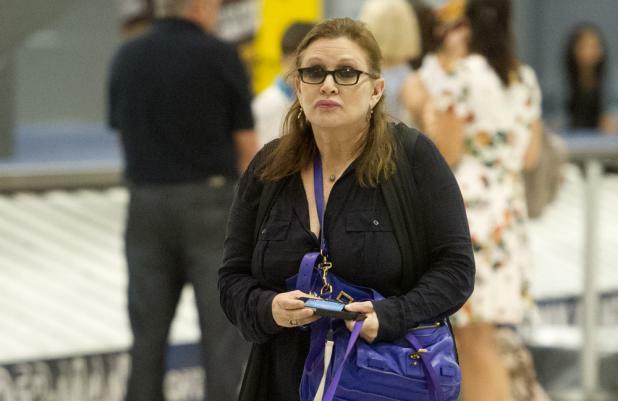 When asked what she thinks Leia will be like in 'Star Wars: Episode VII', Fisher quipped: "Elderly. She's in an intergalactic old folks' home. "I just think she would be just like she was before, only slower and less inclined to be up for the big battle." Carrie revealed Leia's "bagel bun" hairstyle will make a comeback in 'Episode VII' and joked the character might have sundowners syndrome, a condition which leads to people having behavioural problems while the sun is setting. She added: "The bagel buns and the bikini, because probably she has sundowners syndrome. At sundown, she thinks that she's 20-something. And she puts it on and gets institutionalised." Carrie's revelation comes after Ford signed up to reprise his role as Han Solo, and Hamill recently said he wants to get the "whole gang" of original actors to appear in the new movie. He explained: "I said to George [Lucas, 'Star Wars' creator] I wanted to go back to the way it was. Last month, Carrie was hospitalised following a bizarre bipolar episode on a cruise ship in the Caribbean - which saw her singing snippets of songs, slurring her words and chasing her dog - but she has since had her medication for the disorder adjusted and has been discharged. Last week she was said to be doing "exceptionally well".